Pick an adjective out of a hat and it’s likely to fit the Denver Nuggets 2017-18 season like a glove. Exhilarating, but deflating, inspiring, yet infuriating, unforgettable — heartbreaking. With the season on the line, the Nuggets left it all out on the court, but they came up just short as the Timberwolves ended their playoff draught with 112-106 win in overtime. After 14 years of frozen hell, Wolves fans will watch their team compete in the postseason. Jimmy Butler and Gary Harris were both in action after missing most of their respective team’s games down the stretch — neither played in the prior meeting between these squads at the Pepsi Center and one of them had a particularly strong first half on Wednesday night. ‘Jimmy Buckets’ poured in 16 first half points, as did Minnesota’s other star, Karl Anthony Towns. The two of them absolutely carried the Wolves offensively. Denver might have been able to withstand the onslaught from those two but the most deflating baskets came from one Andrew Wiggins. Wiggins was horrendous in the prior meeting between these two teams, but he was on his game in this one. He stayed within himself on offense, made an impact on the other end of the floor and knocked down his wide open three point opportunities. Denver kept themselves in it thanks to a strong first half from Nikola Jokic and Will Barton. They were the high-men for Denver each finishing with double digit points on efficient shooting. They were essentially the only Nuggets who had it going in the first half and they just barely managed to keep the Nuggets within striking distance. 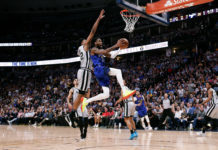 The Timberwolves held an eight point advantage after 24 minutes and the momentum appeared to be heavily in their favor. But anyone who has watched this Nuggets team knows how they respond when backed into a corner — they come out swinging. The punches landed on Wednesday night. The game had a playoff like atmosphere, hell, this was a playoff game, and the officials approached it accordingly. They swallowed their whistles and the physicality didn’t favor Jokic. 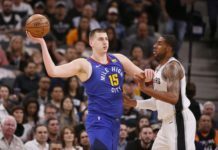 He was struggling to establish himself inside, so in the third quarter Jokic looked to make an impact with his jump shot. Sweet lord above did he make an impact. Jokic scored 17 points in the third on 7-7 from the field and 3-3 from deep. He was absolutely remarkable and entered a zone even Nuggets fans have rarely seen him enter. There was nothing Taj Gibson could do to slow him down and Jokic’s teammates jumped on his back as he carried them back into the game. Somehow, someway, Denver trailed by just three headed into the fourth quarter. The momentum had swung heavily in Denver’s favor, but the bench unit failed to capitalize in the opening minutes of the fourth. With Jokic on the bench, the offense fell to pieces and the Wolves stabilized, executed, and wrestled control of the game back from Denver. Butler, Towns, and yes, Wiggins, continued to come up big for the Wolves as they pushed the lead back up to eight with roughly four minutes remaining. Nuggets fans might not have had confidence in a comeback, but they had to be confident that the game wasn’t over just yet — that their guys wouldn’t go down without a fight. A season this fun and this memorable deserved a better ending than a double-digit loss, it deserved one final push and one more wild finish. We should have seen the 8-0 run coming. Coming out of a timeout, Jokic drilled another three to cut the lead to five. Jimmy Butler was fouled on the ensuing possession, but remarkably, he missed both free throws. Jokic grabbed the rebound and he found Jamal Murray as they crossed half court. Murray drew a switch and took Taj Gibson to the hole, only to hit the breaks and lose the veteran with a filthy step back jumper. He nailed the shot and cut the lead to three. Butler turned it over on the Wolves next possession and the ball wound up in young Murray’s hands again with just under three minutes remaining. Murray initiated another step back, bounced behind the line and chucked up a massively important three pointer that took it’s sweet time traveling through the air. Eventually the shot found the back of the net, and the scoreboard displayed an even score for the first time since the first quarter. 99-99. Jimmy Butler stuck a floater on the ensuing possession to give the Wolves the lead, but Murray responded immediately. He found a hole, drove down an open lane with a head full of steam and drove straight into the chest of Karl Anthony Towns. Lots of contact, no foul call, but a ridiculous left handed finish from Murray nonetheless. Tie game, again. Both teams missed their next two shots and the Wolves wound up with possession and 30 seconds left on the clock. A go ahead bucket from Butler felt inevitable and it was no surprised that he rose up for the shot with five seconds left — it was surprising, however, that he bricked it. The Nuggets collected the rebound and called timeout with a chance to win the game and send themselves to the playoffs — unbelievable. Malone drew up play that resulted in a post up for Jokic, but the big Serbian struggled to get position on Taj Gibson. Gibson bullied Jokic off the block and Nikola received the ball almost outside the three point line. He took a couple of awkward dribbles and tried to draw a foul with a desperation shot and some flailing of the arms. Gibson picked the ball clean, grabbed possession and called a timeout — unbelievable. Minnesota had a chance to win the game, but the best look they could find was a deep heave from Jamal Crawford, which never had a chance of falling. 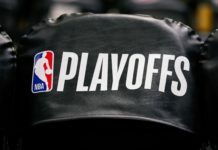 81 games and four full quarters had been played and the Western Conference playoffs remained undetermined. Of course this game went to overtime. The officials all but swallowed their whistles in the final minutes. 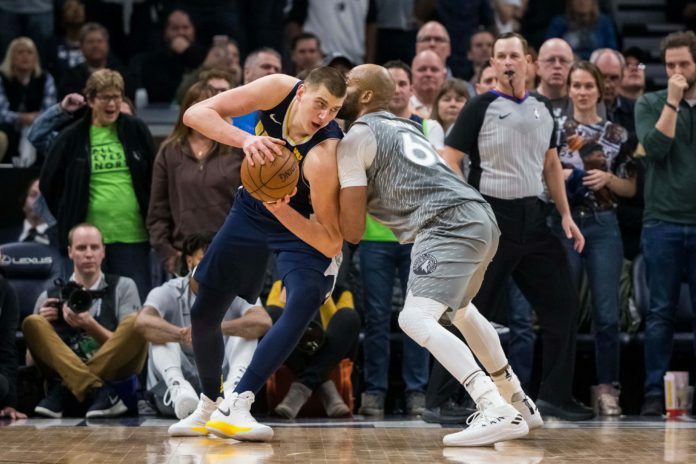 Taj Gibson — who is typically tasked with guarding Jokic — ratcheted it up a notch and began to bother Jokic with his strength and tenacity. Jokic has a tendency to play for the whistle and he can check himself out games mentally when calls don’t go his way. That was the case again in overtime as Gibson successfully irritated him and threw him off his rhythm entirely. Denver still had plenty of chances to win in overtime despite Jokic’s struggles. They withstood a couple of quick buckets from Butler and took a 106-105 lead with 2:28 remaining as Millsap knocked down jump shot. Towns drove to the rim on the ensuing possession but couldn’t draw a call and missed his layup. Denver had the lead and the ball with two minutes remaining. It felt, for a second, as if they might just pull it off. That’s what made the next possession so deflating. The Nuggets barely got a shot off after 24 wasted seconds of offense, and the shot — a desperate three from Jokic — missed the rim entirely. The Wolves took a two point lead after Butler knocked down a free throw with 40 seconds remaining and Denver inbounded the ball for the most crucial possession of the season. The possession was frantic and laced with panic, the ball moved like a hot potato before it settled in Millsap’s hands as he drove to the rim. Millsap seemed to slip as he drove and he chucked the ball back over his head as he hurdled out of bounds. The ball found itself in Barton’s hands beyond the perimeter and all of Nuggets nation prepared themselves for the biggest three of the season. Much to their collective surprise, the three never came. Barton — the most confident man in the city of Denver — passed up the open look and drove to the rim before short arming a floater. Towns grabbed the rebound and the Nuggets fouled Wiggins down two. With two clutch free throws, Andrew Wiggins erased all the doubt and criticism that had surrounded him this season. With two clutch free throws, Andrew Wiggins ended a 14 year freeze on playoff basketball in Minnesota. With two clutch free throws, Andrew Wiggins ended the Denver Nuggets season. The Wolves would hang on for a 112-106 victory.